The Methodist Episcopal Church of Camden was organized on June 26, 1869. On November 15, 1869, the original Board of Trustees requested the pastor to make inquiries in regard to the style and cost of building a church. At later meetings, costs were discussed, a site selected, and building began. The church would be of brick, 36 x 54 feet, with a belfry 8 x 8 x12 ft. In 1872, a bell was selected at a cost of $300. The church debt was paid in full by August 1883, and a parsonage was built in 1889. In the years between 1929-1931, there was discussion of building a new church, but little action. A small building fund was started, and then Rev. Joseph C. Rice came and things changed. Rev. Rice proved to be a Jack-of-all-trades and a master of them all. He was an engineer and architect. He could get the old church condemned and torn down, find a place to hold church services and help finance a loan. He could interest people to give of their goods and time. He was a leader, a good shopper and wrote endless letters to firms asking for bids and quotations. He knew what the church needed to be like to serve the community for now and in the future. There was a dedication service in December 1931, with Bishop Nicholson conducting this service. He was the pastor at Camden M.E. Church when the first building was finally paid off. The Evangelical United Brethren Church and The Methodist Church were united in 1968. On the morning of December 25, 1984 tragedy stuck, the church was found totally engulfed in flames. A building committee was formed and the church arose from the ashes with donated time and funds from the community. Church services were held with the Montgomery church, and in the fall of 1986 we had our first worship service in the new church. 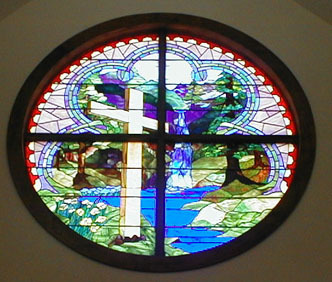 Incorporated into the new church was artistic stained glass, depicting different scenes from the bible. The bell, which had been on a stand on the front lawn, was now put into a bell tower. On Sunday, June 7, 1992, the dedication of our new building was held. David B. Nelson, Jr., a former pastor of the church, gave a dedication address. Pastor Fred Hamlin, the pastor at that time, conducted the dedication service. The past is behind us, many things we can be proud of, many things we wish we had done differently, many things made us want to go back to the past. It often seems that life was easier then, but it wasn't, many people have worked hard before us so that that our church and the Church Universal could be where it is today. There were others who left some things undone, which need to be done. This is where we come in. The future is upon us. One hundred years hence, will there still be a church, will it belong solely to the past? Change for the sake of change alone, is irresponsible. Change to make the Gospel relevant to the needs of mankind is our Christian responsibility. 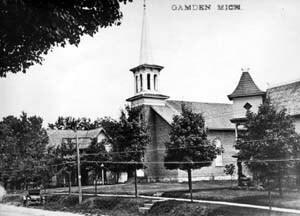 We owe a debt to the past, the people who have worked hard that the United Methodist Church of Camden, Michigan might exist for one hundred years. We thank them for their faith and works. We pledge ourselves to renew our faith and increase our work that the Church may not merely have stood for one hundred plus years, but, more important, that the Church may serve for the years of plus 100.  For if we cease to serve we cease to be a Christian Church. In the end, the Church, her laws, her forms of worship, her institutions, and ceremonies, will become one with the world in it's fulfillment. But we are not yet at the end. For the present we have to live in the tension of Church and world, Law and gospel, form and content, fact and potential. If we are going to be realistic, then we have also to be patient, and to act where we are with the means we have, even if some of these seem sadly imperfect. But this is a realism guided and strengthen by the Christian hope, the hope that all things come to their destined fulfillment in God. In this faith we stand, taking our perspective from the past looking towards the future in anticipation and hope. We stand in the present on the launch pad, the future is upon us.